Like Many food bloggers - Thanksgiving is by far my favorite holiday. What's better than an entire day centered around food. I woke up bright and early on turkey day to prepare the bird. My mom now lets me prep the turkey - this is a big deal in our family. I had mixed the butter for the rub the day before. For an 11 lb turkey it was 1 stick of butter, 2 cloves of garlic chopped, and chopped thyme and chopped sage - approximately a loosely packed tablespoon of each, along with some salt and pepper. I also like to add some lemon zest - but we didn't have any lemons! 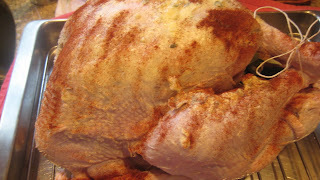 I loosened the skin from the turkey and rubbed the butter between the skin and the breast meat. the I rubbed the softened butter all over the surface of the turkey - legs, wings, everything! The entire surface was then sprinkled with paprika. We're Portuguese so everything we roast gets paprika on the top ... it also helps the skin to brown and crisp! After salting and peppering I put half an orange (usually a lemon but we made do) into the cavity of the turkey and a few sprigs each of thyme and sage. Then the little fella went into the oven and my parents and I shared breakfast. 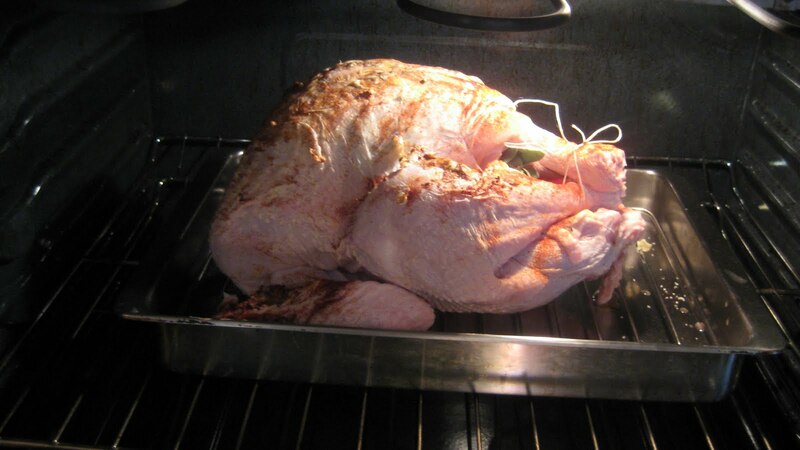 I basted the bird a couple times, then I went downstairs to workout and my mom took over the turkey duties. 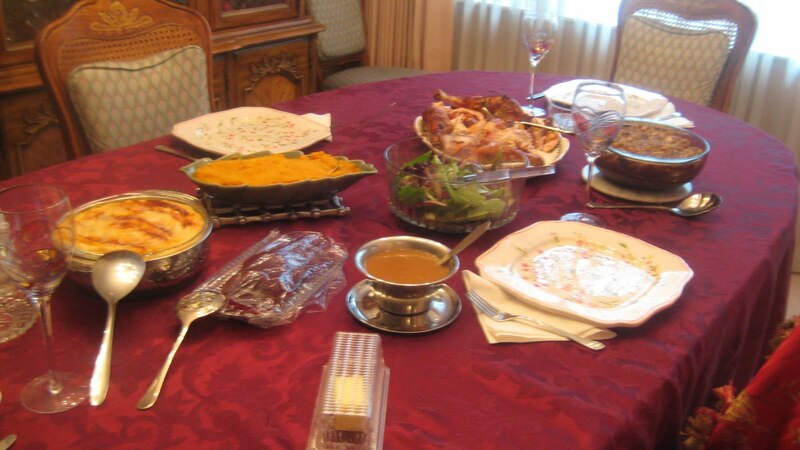 Here is our table all set for dinner. We have a small, intimate meal. Just my parents and my grandmother...and all the fixins! 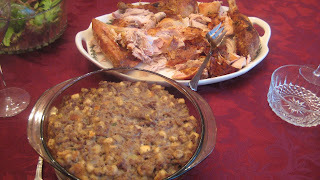 Turkey and my mom's famous stuffing! There is a salad in the corner too. 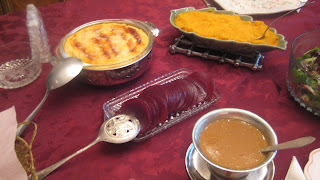 Clockwise, mashed potatoes, my butternut squash, my mom's turkey gravy - always amazing. And the required canned cranberry sauce. My mother has tried to make fancy stuff in the past, but my dad and I like the jelly stuff....old habits die hard! 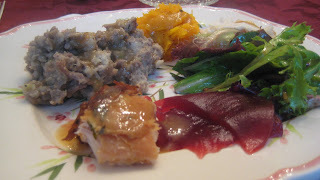 Here is my plate....Notice the abundance of stuffing. It truly is my favorite part of the meal. When my grandmother made dinner she would make a massive amount of stuffing just for me - and I never ever got sick of it! 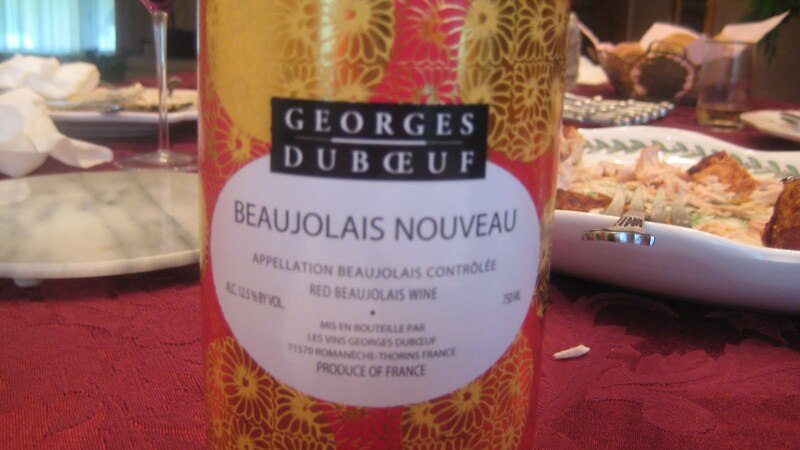 Dinner was paired with the 2009 Beaujolais. I read and was reminded of it by A Couple in the Kitchen - and decided it would be a good (and inexpensive - only $9) addition to our dinner. Even my mom, who prefers white wines - like Rieslings, really enjoyed this wine. It was light and fruity - and paired well with the meal - like cranberry sauce with turkey.